Of all the subjects I learned at school, it was history I loved the most. As a child I used to read history books and stories, from all different periods. I revelled in a growing understanding of how people all over the world had developed – communities, societies, nations and even empires – and how humans had moved around the world, interacted, integrated and battled. All except Australia’s first peoples of course. There was very little written about Aboriginal people in any of the books I read, even in Australian history books. Aboriginal people began to come out of the shadows of public life from the 1970s. When The Other Side of the Frontier was released 1981 it was as if someone had opened the door to a whole new part of Australian history that had been hidden. Reynolds’s book remains one of the most significant books to be written about the history of Aboriginal people during the years of colonisation. History is fascinating and enticing, not because it’s pure but because it’s not. Human history is a record… of humans: the brutality of which humans are capable and also the incredible capacity of humans to advance, to learn from wrongdoing, build better societies and to improve the quality of all life. The events in Germany and Western Europe in the first half of the 19th century were among the most brutal in modern history. Amidst all this there were also incredible stories of bravery and kindness, the best of what humans are capable of. 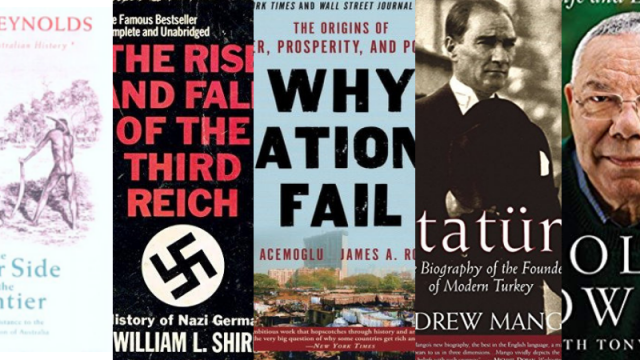 Shirer’s book provided not only a history of what happened but background as to why and how it happened, documenting the rise and fall of the Nazis from Hitler’s birth to the end of World War II. Shirer was a US journalist based in Berlin from 1934 and who reported on the first year of the war while he was embedded with German military. He had access to the diaries of key figures in the war including Goebbels. His work therefore shows the human elements of these events; normal everyday people getting up every day and committing the most heinous acts, as well as those who resisted the Nazis and helped its victims with great bravery and compassion. It’s a history book but above all it’s a book that provides an insight into the spectrum of humanity. Why Nations Fail is a fascinating and detailed analysis of why some nations thrive and others don’t, even when they share the same geography, peoples and culture. The book talks about what it calls “inclusive institutions” and “extractive institutions”. Inclusive institutions allow everyone in society to participate in education, business, the financial system, government, enforce property rights, create a level playing field, and encourage investments in new technologies and skills. They distribute political power widely and uphold law and order and a free-market economy. Extractive institutions take resources from the many for the few. Certain groups (for example, the ruler’s family or the ruling party) have more opportunities than others, and you have to be close to those groups to prosper. They breed corruption and dysfunction, human ambition stagnates, and reform is hard because the few with economic privileges don’t want to lose them. Inclusive institutions breed economic growth. Extractive institutions are a root cause of economic failure. The history and experience of nations all over the world – those that have failed and those that have succeeded – show that democracy, opportunity and a free-market system are far more essential to sustainable economic prosperity than a country’s natural resources, current wealth or history. In my twenties and thirties as I observed the early years of Aboriginal land rights in action, I came to realise that the solutions for Aboriginal disadvantage did not lie in community and government-led solutions or in communal structures, but in economic participation, unlocking economic opportunities from land, enterprise and individual achievement. This book gave me the empirical and real-life explanation as to why. Since childhood I’d been drawn to the history of peoples around the world who’d rebuilt their societies from positions of existential weakness to positions of strength. I’d observed that the societies that survived and thrived were the ones that adapted, that harnessed their traditions and culture as a force of strength while taking the best that the rest of the world around them had to offer. Studying these groups of people has been one of the greatest influences on my thinking and vision for Aboriginal people. As a child I was fascinated to read about Japan’s Meiji Restoration which taught me that the struggle between tradition and modernity is not unique, and that ancient nation has survived by being frozen in time. This book introduced me to Kemal Ataturk, and how he transformed the Turkish people from medievalism to modernity. After the Ottoman Empire fell in World War I, Ataturk, one of the “Young Turks”, took charge. Turkey would look to the West, not the Arab world. He was relentless in shunning religiosity and building an unashamedly secular state – abandoning Persio-Arabic script in favour of Latin script (as for English), modernising and reforming the economy and education, bringing in rights for women and eventually banning religion-based clothing. It has been disappointing to see Turkey slip away from secularism in recent years but it demonstrates that even great ideas and principles must be upheld with constant vigilance. To me, Colin Powell’s words deftly summarised Australia’s crisis of political leadership. Our political leaders today lack courage and they lack determination. They don’t have the courage or determination to champion what they know is needed to fix Australia’s problems and secure Australia’s future success. They are not championing good ideas and pressing them until they succeed. And they don’t fight the damaging, and sometimes downright stupid, policies and practices that are beginning to take hold. They are not driving a stake through the heart of bad ideas. Powell has written many books about his life, experiences and outlook. This book outlined his thoughts on leadership, based on his experiences in the military and politics. He writes in an unassuming and matter-of-fact style, with personal anecdotes and reflections and a healthy amount of self-criticism. It was after finishing this book that I decided to write my own. Warren Mundine’s latest book is In Black + White: Race, Politics and Changing Australia (2017, Pantera Press).